Every summer, my family would throw barbecues on nearly every nice summer evening. We would make burgers, chicken, corn, and a variety of salad. Someone would also bring over alcohol spritzers and other fruity drinks for us (we’d make Shirley Temples for the kids). We loved discovering new flavors and brands of drinks and trying to find the best of them. 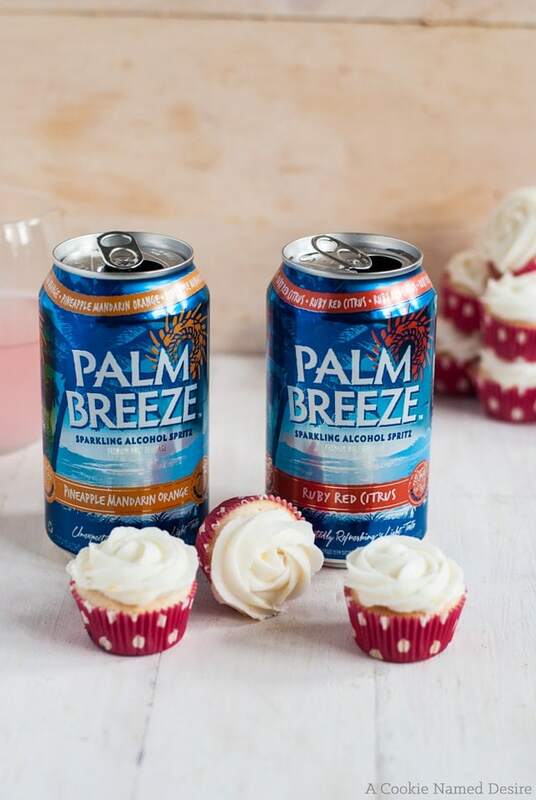 When I found out about Palm Breeze, I was definitely intrigued and couldn’t wait to try some now that the weather is nice and we are already starting to barbecue. 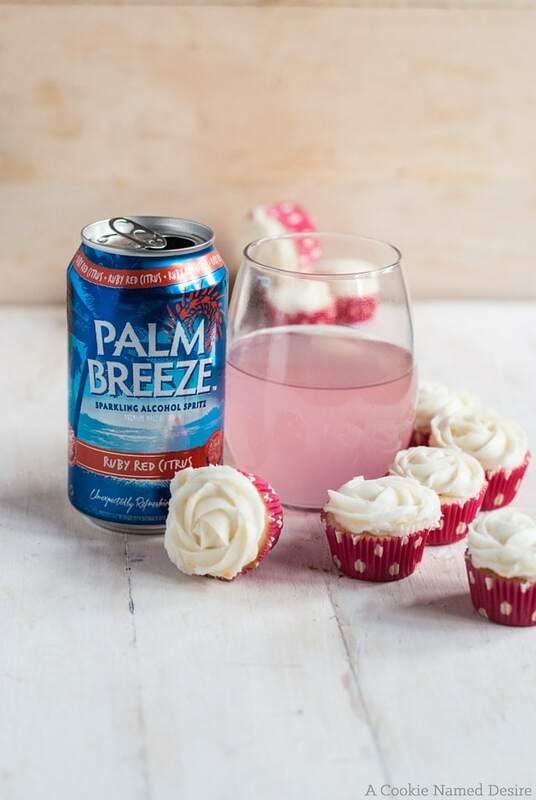 Palm Breeze isn’t like any other drink. It is a flavored malt beverage (FMB). Which basically means it’s an alcoholic drink made with a malt base, kind of like beer. They have two flavors: pineapple mandarin orange and ruby red citrus. Both are incredibly fruity and citrusy, I can’t decide which I like best because they were both so refreshing. Drinking them makes everything like a mini tropical vacation. 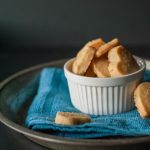 I knew I wanted to create a treat we could enjoy while drinking our spritzers after the barbecue. It had to be something small we can just pop in our mouths, and reflect that fruity citrus zing the drinks both have. A mini cupcake with a surprise fruit center and a lemony frosting was the perfect little treat. I used my favorite cupcake recipe because it is so light and moist, plus it bakes up beautifully. You can use almost any fruit you want, but berries really work the best here. 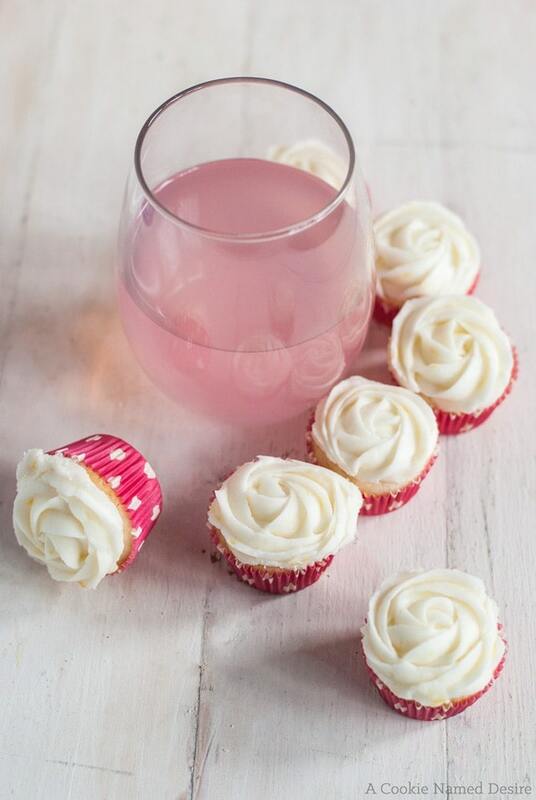 And if you want to more closely follow the flavors in the drinks, you can easily replace the lemon with either red grapefruit or orange in the frosting. There’s really no going wrong here. Preheat the oven to 350 degrees and line a mini cupcake pan with liners. Sift the flour, baking powder and salt together in a medium bowl. Set aside. Cream the butter and sugar until light and fluffy. Add the vanilla extract. Add the egg whites one at a time, mixing well between each egg. Add the flour and the buttermilk, alternating between each. Start and end with the flour. Do not over mix. Fill the cupcake liners ⅔ of the way through. Drop in a berry into each cupcake and lightly cover it with batter. 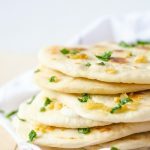 Bake for 10 - 15 minutes, or until a light golden brown. Beat the butter until very smooth and creamy. Add three cups of sugar slowly, one cup at a time. Add in the zest and lemon juice. Add more sugar as needed to thicken the buttercream, about another ½ cup to a full cup. Fit a piping bag with a tip of your choice (I went with a star shape). Fill with the butter cream. Pipe a small amount of buttercream onto each mini cupcake. To make a flower as I did, simply start at the center of the cupcake, at a 45 degree angle, and twist the cupcake around as you pipe. 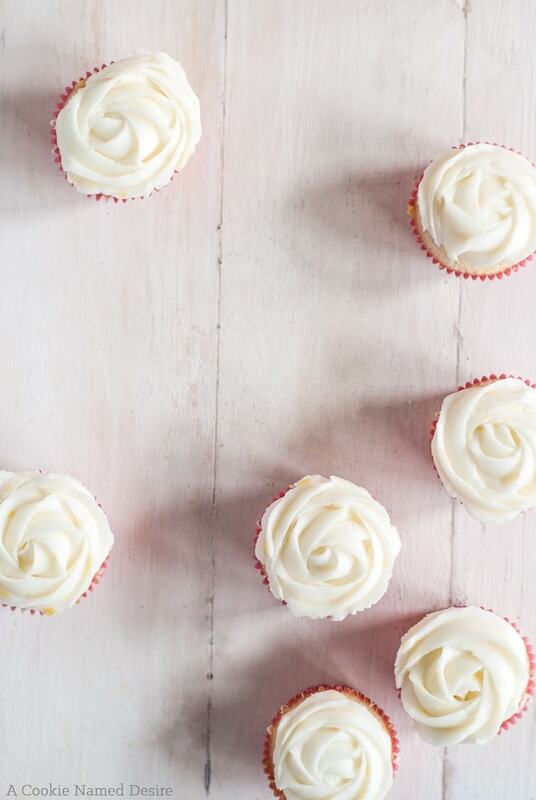 Gently release pressure as you reach the edge of the cupcake.